Hiyajiru is a dish from Miyazaki Prefecture. It is said to have been developed by farmers as a way to whip up a nutritious meal without taking too much time away from farm work. ① Slice the cucumber into thin rounds. Julienne the green shiso leaves. Skin and grate the ginger. ② Use a suribachi (すり鉢 = mortar and pestle) to coarsely grind the white sesame seeds. Spread the miso on a wooden spatula and then expose the miso directly to an open flame. Lightly roast it to bring out the fragrance of the miso and then add it to the suribachi. Add the mackerel together with the water from the can and then use the surikogi (すりこぎ = pestle) to break up the mackerel. Add the water and mix the contents of the suribachi well. ③ Use a fork to break up the tofu, and then add it together with the cucumber and grated ginger, to the suribachi and give a couple quick stirs to combine the ingredients. 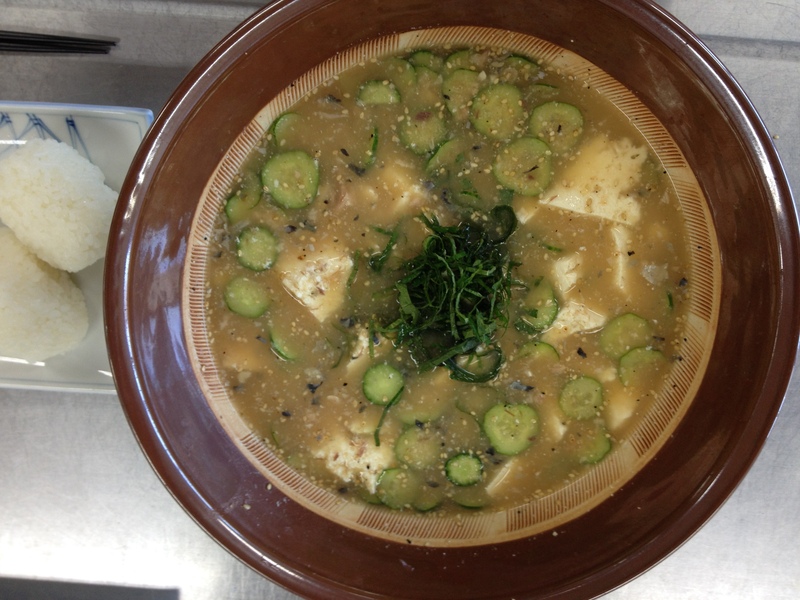 Serve in bowls and top with the green shiso. One way to prepare traditional hiyajiru is to first add roasted fish (broken up into pieces), sesame seeds, and miso to a suribachi and then grind this up with the surikogi. When this becomes a paste, it is then spread evenly on the inside of the suribachi, and then the suribachi is heated until the paste is lightly browned. At that point, cold soup stock is added to dissolve the paste, and ingredients such as tofu, cucumber slices, shiso, and myōga are mixed in. This mixture is then poured onto cooked rice or a mixture of cooked rice and barley and eaten.